Could there be a cosmic significance to the coincidence that, two days ago, Li Na, a Chinese tennis player, was the first Asian to win a Grand Slam singles' tournament at the French Open, and, during that very same week, I (the #1 fan of all things French) got to play tennis - twice - for the first time this season with the #1 fan of all things Chinese? Perhaps not, or perhaps it is auspicious, as the Chinese often say. Either way, I can state with confidence that an opportunity to play tennis at the Central Park Tennis Center should not be missed! You can arrive from the Central Park Reservoir, perhaps in your tennis duds (smooth soled tennis shoes only, no running shoes, alas) via this beautiful white bridge, or perhaps riding your bike to Central Park with your tennis racket bag slung over your shoulder; both seem just so insider New York. For years, I had no idea how anyone did it, that is, got access to court time, mainly because I was simply too preoccupied to even try to find out. But, shhhh, it's relatively simple, even if all the arrows in this sign make it look pretty complicated. The website explains it better than I can, because there are a couple of reservation options; and opening dates and times are important to know, too. In brief, though, basically anyone with some time to get over to the courts to sign up can reserve and confirm an hour of court time that same day. 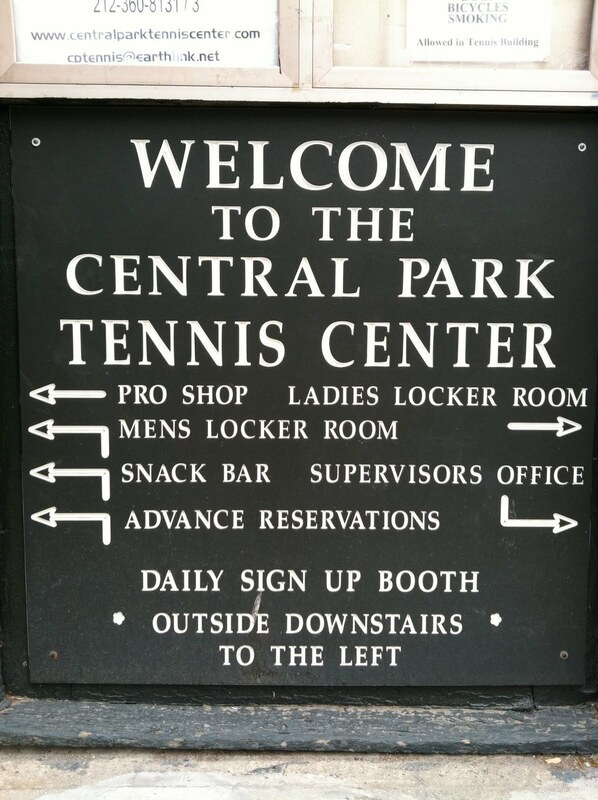 30 clay courts await you (as well as the Central Park Tennis House replete with snack bar, fully equipped locker rooms and a pro shop)! With a terrace like this perched for maximum viewing of the courts, and those impressive columns, it's possibly the most civilized "house" in the city.